The People Have Decided: The Country Must Be Defended (photo: Orange Files). The significant majority of the slightly over one million Hungarians who responded to the questionnaire expressed strong support for the imposition of stricter measures to regulate immigration and control Hungary’s borders (source in Hungarian). Therefore “The People” who according to the Orbán government’s new anti-migration sign decided that “The Country Must Be Defended” represent around ten percent of the eight million Hungarian citizens who received the National Consultation on Immigration and Terrorism. 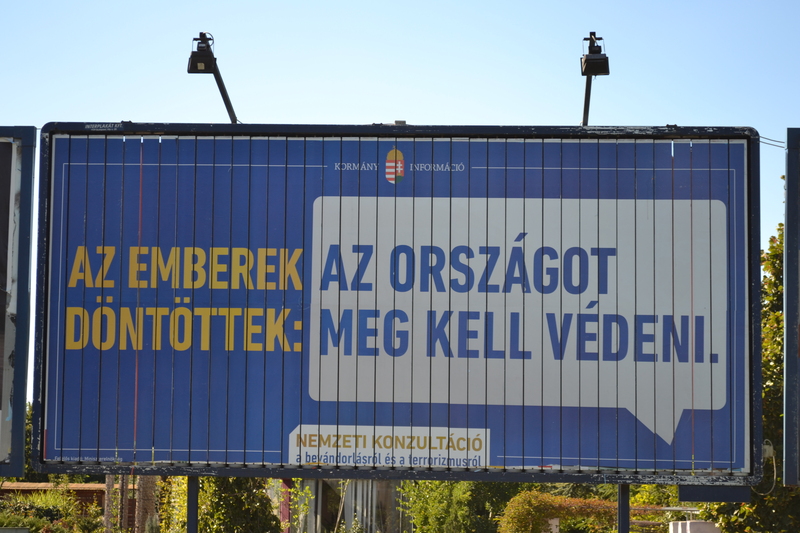 For information regarding the Orbán government’s first anti-migration sign campaign see Sign War I. For information regarding the sealing of the final gap in the Hungarian-Serbian border see The Curtain Falls Again.